Even though the thru hull fittings and scuppers on your boat help keep it afloat, many builders still "cheap out" in this area. 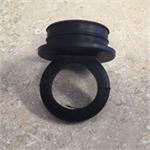 If you need to replace them we carry many original equipment fittings along with better quality upgrades. 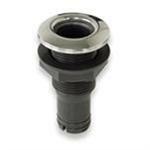 All of our fittings have barbs to fit marine hose (cheaper industrial fittings will be slightly larger and hard to get on the hose because industrial hose runs larger than marine hose). Please keep in mind that (except for a few exceptions) plastic thru hulls and scuppers should only be used above the waterline. 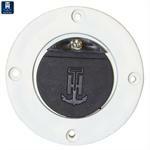 Don't see the thru hull or scupper you need? We can get them in any thread or barb combination from 1/2" to 2", so just click "Contact Us" and let us know what size you need! 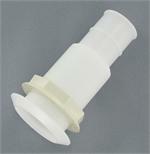 If your fitting is OK, why replace the whole thing? 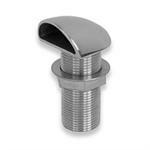 Stainless steel oblong scupper has a rectangular rubber flapper.